Yawning. We all do it. I’m yawning right now, just writing about yawning. It turns out the yawn is a very complicated system. It is thought the yawn rejuvenates the brain and keeps us alert. All vertebrates yawn, even fish. I am not sure I believe fish yawn, I have watched and I have never seen the fish in my aquarium yawn. Yawning occurs more in the summer and during times of anxiety and stress. In one study, they discovered that yawning is like the cooling fan for the brain, and yawning maintains an optimal brain temperature, which may explain why we yawn more in the summer. There contradictory results to these studies as well. Does that mean people who live Alaska yawn less than those that live in say, in the Sahara? It also explains why we may yawn when we are stressed or anxious, both of these increase the temperature of the brain, and the process of yawning cools the brain down. Our brain temperature is highest at night, hence we yawn more. I read the process of yawning by opening the mouth wide, sends cooling air to the sinuses and vascular mucous membranes, thereby quickly distributing the cool air to the brain. It is thought the reason yawning is contagious is not because of empathy but because it is a social function which keeps the members of a group alert and vigilant. But then there are a multitude of studies that suggest yawning is an act of empathy, and the most contagious yawns are from those with whom you are genetically connected. Studies suggest that infants and individuals with autism are not as susceptible to the contagious effect of yawning. Yawning is an involuntary process as documented by fetuses as young as 11 weeks yawning in utero. The typical yawn lasts 4 to 7 seconds. The average person yawns about eight times per day. 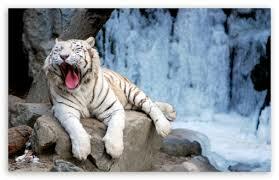 Sometimes excessive yawning can be a symptom of a disorder such as epilepsy or possibly encephalitis or a brain tumor. Looking at all these pictures of animals and people yawning has caused me to yawn over and over, which means I am either genetically connected somehow via the internet to these animals or I am an amazingly kind individual who shows empathy to all the animals I have looked at tonight, including the snake. I am pretty sure, in no way, do I have empathetic tendencies towards a snake. This can only mean one other thing, I am tired, my brain temperature is high and I need to go to sleep. Which is exactly what I am going to do, right now. Honestly, I get the impression no one really understands what makes us yawn. Thanks to wallpaperswide.com for the photo. Great, after yawning every time I read “yawn” in this piece, now I think I have a brain tumor! Excessive yawning, hmm!? I yawned when I got up this morning, and thought – what if the information in my Yawn post isn’t right. Then I became anxious and I sensed my brain temperature was rising, so then I yawned again. Maybe I have one too. Jeez – something else to worry about. We must be related. I yawned at least 4 times reading this post! Ahhh! My suspicions are true. Genetic connections are transmitted via the Internet. Strange?! Ah, your yawning post is definitely more educative than mine. Oops. You did yawn too.. See..I told you it’s contagious!!!! Thanks!!! I bet you never knew there was so much to know about yawning! I yawned today. A lot. And immediately thought of you, haha! Ha – that’s funny!!!!! Because I yawned today and I was like oh, yeah cooling fan for my brain. I was thinking about that too, cold fluids should help with the brain cooling thing. Most excellent. It’s basically science. And who can argue against SCIENCE! ?